Rich in history and populated by people so ethnically diverse, West Bengal could take your breath away with its tourism related assets alone. From remnants of the colonial era to fiery reds of Goddess Kali, the modern West Bengal has come a long way. Its capital city Kolkata is now one of the most popular cities that promise many opportunities. And not to mention popular tourist locations like Darjeeling, Murshidabad and Kharagpur to which thousands flock every year for some respite from the city life. In the recent past, many have migrated to this vibrant state in search of jobs and culture and that in turn witnessed the real estate market blooming much. Hence, for all of you planning to involve in rental transactions, LegalDesk brings you a guide on how to draft a rental agreement and make it legally valid in the state of West Bengal. Prepare the Rental Agreement Draft by adding personal details and appropriates clauses. Normally, the tenant and landlord discusses the clauses they wish to include and then approach a lawyer to do the drafting. 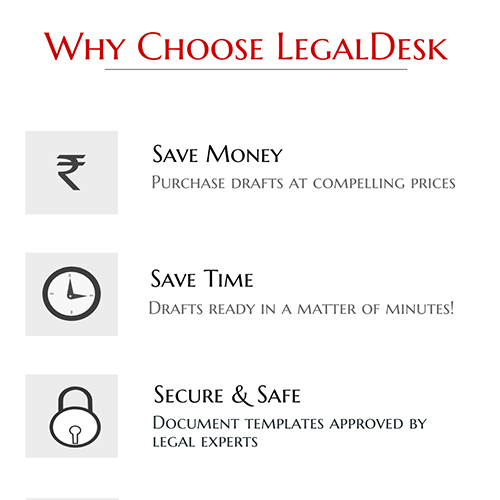 The lawyer takes care of the Stamp paper and registration part most often. However, this method could be time consuming and the charges for getting this done may vary according to what your lawyer of choice may charge. Now, you can prepare rental and lease agreements online, which is the fastest and the most economical method. Stamp Duty is a tax that is levied on documents for making them legally valid. In late 2012, West Bengal introduced e-Stamping facilities in 10 centres around Kolkata. However, the state is yet to switch to the e-Stamping system completely. This means that both e-Stamp paper and conventional Stamp paper are currently in use with the smaller cities still depending on the conventional Stamp papers completely. Registering a document deters fraud and also reveals all matters related to the property under question. It is also a way of authenticating that the people mentioned in a document are indeed the ones who created it and that not forgery has occurred. If registration is overlooked, the document will never be considered as valid evidence in court instead it will be considered as collateral evidence. You need to pay the appropriate registration charges in the Sub-Registrar office at the time of registering the deed. It varies from State to State and also according to each year’s rules of Stamp Act by the respective State Governments. 11-Month Rental Agreement – Typically used in most rental transactions, the 11-month rental agreement is one of the most commonly used rental agreements throughout the country. The term of the lease is 11 months following which both parties can choose to either renew it or end it. Registration and notarization are skipped most of times as the term is less than a year. Long Term Lease – Signed commonly for residential purposes, long term leases have durations in years. They involve large sums of money to be paid upfront and this sum is often returned to the tenant at the end of term. They are less frequently used as compared to the 11-month rental agreement. Commercial Lease – Signed exclusively for business deals, commercial leases involve large sums of money and long periods of duration. Commercial leases have an agreement format that is quite different from that of residential rental agreements. They do not have a standard format as needs and clauses vary with the type of business. Monthly rent, security deposit & maintenance charges: Values for each much be clearly mentioned in the contract to avoid ugly spats. The frequency of payments must also be mentioned. Lock-in period: The minimum duration for which either party cannot terminate the rental agreement is called the Lock-in period. This ensures that neither party backs out soon after the move is made and thereby incur losses to the other party. Duration of lock-in period must be specified in the rental agreement. Permission to house pets: Some folks are averse to the idea of animals inside their houses. If you have such an aversion, the tenant must be notified about it through the contract. Consequences of overstay: Should the tenant continue to occupy the premises even after the term of the lease is up, the Landlord is free to charge a penalty which was agreed upon in writing. Consequences of late payments: If the tenant fails to pay rent before the stipulated date, the penalty for the same must be spelled out in the contract. Food habits: If you are a landlord who does not wish to encourage consumption of non-vegetarian food/alcohol/ other edible items of your choice, it shall be explicitly mentioned in the contract. Owner’s authenticity: Ask for documents that can attest to the fact that the guy posing as the landlord is indeed the landlord. Payment receipts: Insist on getting back receipts for every payment you make. Deductions from security deposit: At the time of vacating, the landlord is expected to return your security deposit to you after making necessary deductions. It is your job to ask a detailed description about how much was deducted for what. Agreement registration: If you skip registration and a legal battle ensues, the court will never consider your rental agreement as primary evidence. An unregistered contract is only seen as collateral evidence. Security Deposit – This is a few months worth of rent collected in advance from the tenant. At the end of term, the landlord is expected to return this money to the tenant after making deductions for regular maintenance. In West Bengal, 2-3 months worth of rent is typically collected as security deposit. Token Advance – This is a very small sum of money collected by the landlord from the tenant with the intention of booking his property for the tenant and preventing other potential tenants from developing an interest. Once the token advance is paid, the deal is considered final. If either party backs out, he/she should compensate for the losses incurred by the other party. In most cases the token advance is not refunded.